397 Commonwealth is located on the north side of Commonwealth, between Massachusetts Avenue and Charlesgate East, with 395 Commonwealth to the east and 401 Commonwealth to the west. 397 Commonwealth was built in 1924 on a vacant lot by the W. H. Whitcomb Construction Company. It was built for the Moorland Company, which shown as the owner on the original building permit application, dated March 14, 1924. 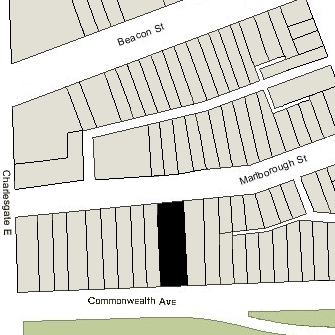 The rear of the lot on which 397 Commonwealth was built extends north to Marlborough Street and has a secondary street address of 446 Marlborough. 397 Commonwealth also occasionally appears with the address 399 Commonwealth. 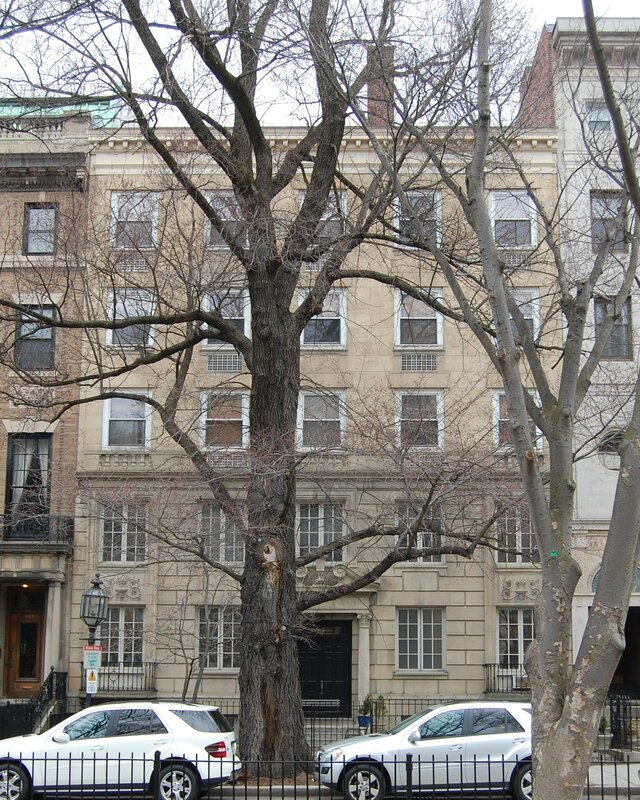 The architect indicated on the original building permit application is H. B. Andrews of 40 Court Street in Boston. There is no architect of that or similar name listed in the City Directories for the period, nor is there any architect listed at 40 Court. It appears that the architect may have been Hiram Bertrand Andrews, a civil engineer and expert on reinforced concrete, who, in the 1920s, was a partner in the engineering firm of Andrews, Tower, and LaValle, of Springfield, Massachusetts. The Morland Company purchased the land for 397 Commonwealth on July 25, 1923, from real estate dealer William H. Ross. He had purchased it on December 26, 1922, from the estate and heirs of Charles Edward Cotting, who had died in July of 1920. He and his wife, Ruth Stetson (Thompson) Cotting, had lived at 404 Marlborough. Charles Cotting had purchased the lot on March 1, 1904, from Alexander Agassiz, who had purchased it on January 17, 1901, from Frederick Ayer. On April 15, 1899, Frederick Ayer had purchased two lots from real estate dealer Frederick O. Woodruff, a 52 foot wide to the east and a 26 foot wide lot to the west. He then built his home at 395 Commonwealth on the eastern 31.97 feet, and sold the western 46.03 feet to Alexander Agassiz. Frederick Woodruff had acquired the two lots on the same day he conveyed them to Frederick Ayer, the 52 foot wide lot from S. Endicott Peabody and the 26 foot wide lot from the estate of William G. Saltonstall. S. Endicott Peabody and William G. Saltonstall had purchased their lots in January of 1886 from a real estate investment trust formed by Francis A. Palfrey, Francis A. Osborn, and Grenville T. W. Braman, both of the lots being part of a tract of land the trust had purchased on June 1, 1880, from the Boston Water Power Company. When the trustees sold the lots to S. Endicott Peabody and William Saltonstall, they included language prohibiting the use of any building on the land as a stable and prohibiting the erection of any building of more than one story in height within thirty feet of Marlborough. When Frederick Ayer sold the vacant lot at 397 Commonwealth to Alexander Agassiz, he included additional language (for the benefit of Alexander Agassiz) specifying that no building in the rear of 395 Commonwealth could be located within 8 feet of the boundary line with 397 Commonwealth. Click here for an index to the deeds for 397 Commonwealth, and click here for further information on the land west of Massachusetts Avenue between the south side of Beacon and the north side of Commonwealth. The Moorland Company was organized by real estate dealer James Sumner Draper. He served as its president and Mrs. Sarah Elizabeth (Williams) Hodson, the former wife of Septimus Hodson, served as treasurer. She was a secretary in J. Sumner Draper’s office. The original permit application for 397 Commonwealth indicates that it was being built as a dental surgery. It does not appear to have been used for that purpose. By the 1925-1926 winter season, 397 Commonwealth was the location of the Fraternities Club, which – based on the List of Residents listing for 1926 – appears to have been a residence for male students and recent graduates. It continued to be located there until about 1928. On March 8, 1928, the People’s Savings Bank foreclosed on the mortgage given by the Moorland Company and took possession of the property. 397 Commonwealth continued to be residence for men, called The Moorland, but was no longer limited to students and recent graduates. On May 1, 1934, 397 Commonwealth was acquired from the bank by the Oliver Investment Corporation. Real estate dealer and property manager Robert A. Nordblom was president of the corporation, which continued to operate it as a multiple dwelling for men, either a lodging house or apartments. On August 12, 1938, the People’s Savings Bank again foreclosed on a mortgage it held on 397 Commonwealth and took possession of the property. On November 28, 1941, 397 Commonwealth was purchased from the bank by real estate dealer Irving Zieman and Samuel H. Gurvitz, a salesman for a building materials and cabinetry company. On May 1, 1942, Irving Zieman acquired Samuel Gurvitz’s interest in the property. On May 15, 1942, 397 Commonwealth was acquired from Irving Zieman by his niece, Minerva B. (Onigman) Dobro, the wife of Maurice Dobro (Dobrow). She was the daughter of Henry Onigman and Irving Zieman’s sister, Bertha Rose (Zieman) Onigman. Maurice Dobro was a life insurance agent and Minerva Dobro owned a novelty store. They lived in Brighton. On December 28, 1951, Irving Zieman acquired 397 Commonwealth back from Minerva Dobro. On May 29, 1953, 397 Commonwealth was purchased from Irving Zieman by the Boston Evening Clinic. It previously had been located at 452 Beacon. It continued to be located at 397 Commonwealth until about 1958, when it moved to 314 Commonwealth. On January 31, 1958, 397 Commonwealth was acquired from the Boston Evening Clinic by the Hearthstone Insurance Company of Massachusetts. It also owned 395 Commonwealth, where it maintained its offices. It operated 395 and 397 Commonwealth as a single building, the Hearthstone Building. In addition to maintaining its offices there, it leased space to other businesses, among them the Frick Company, dealers in refrigerators, and the Paul L. Beane Company, food brokers. On December 28, 1964, 395-397 Commonwealth were acquired from Hearthstone Insurance by the Association for Cultural Interchange, Inc.
An affiliate of the Roman Catholic Opus Dei organization, the Association for Cultural Interchange opened a dormitory and cultural center for women students, Bayridge Residence, at 395 Commonwealth and 397 Commonwealth. In September of 1966, 395 Commonwealth was added to the State Register for Historic Places. In March of 1971, the Association applied for (and subsequently received) permission to remodel the dormitories, including combining 395 Commonwealth and 397 Commonwealth into one building, with the address of 395 Commonwealth. In August of 1974, the Association for Cultural Interchange, Inc., changed its name to The Trimount Foundation, Inc. It continued to operate the Bayridge Residence and Cultural Center at 395 Commonwealth. In June of 1988, it applied for (and subsequently received) permission to build a 300 s.f. addition at the rear of the property allowing the extension of the existing chapel at 395 Commonwealth. In April of 2005, the original building at 395 Commonwealth was added to the National Register of Historic Places. On June 26, 2013, The Trimount Foundation entered into a Preservation Restriction Agreement for 395 Commonwealth with the Massachusetts Historical Commission, designed to preserve “those characteristics which contribute to the architectural, archaeological and historical integrity of the Premises which have been listed in the National and/or State Registers of Historic Places… which include, but are not limited to, the artifacts, features, materials, appearance, and workmanship of the Premises…”. 395 Commonwealth remained the Bayside Residence and Cultural Center in 2018, with the original 395 Commonwealth, the Ayer Mansion, open for public tours, lectures, and events.